The Little Roo Neonatal Fund is the local charity for the Neonatal Intensive Care Unit at St. Peter’s Hospital in Chertsey, Surrey. In the past twenty years the care of babies born very early, or with unexpected problems, has improved immensely, with great improvements in survival and outlook. This work is increasingly specialised and requires dedicated teams of highly trained nurses and doctors, available at all times. In Surrey the only hospital with the appropriate staff, equipment, skills and experience to provide this highest level of intensive care for the smallest and sickest newborn babies is St. Peter’s Hospital. In 2005 a new nursery with eight intensive care cots was opened by HRH The Countess of Wessex. The costs of the building work and extra staff were met by the NHS, but to provide the specialised equipment we needed charitable funds. 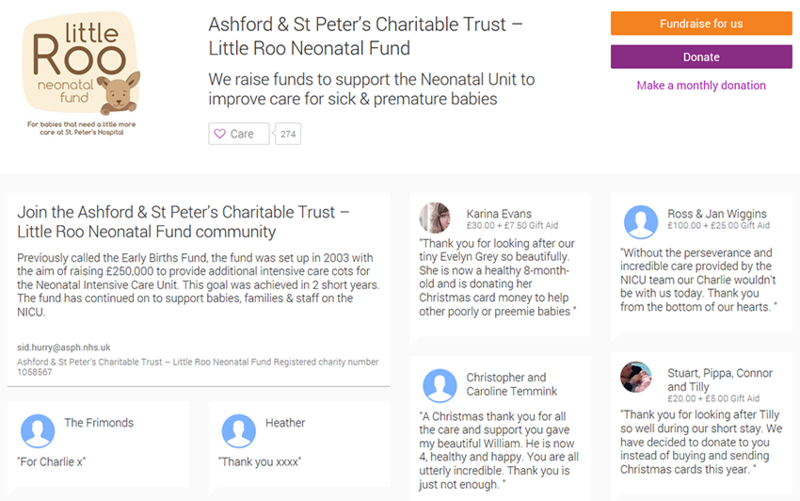 The Little Roo Neonatal Fund was set up by a team of doctors, nurses, parents and support staff and is part of the Ashford and St Peter’s Hospitals Charitable Trust (Reg Charity 1058567) with the specific aim of supporting the Neonatal Intensive Care Unit. Each Neonatal Intensive care cot costs in the region of £80,000 to fully equip, and we also have been able to purchase an ultrasound machine (£60k), equipment to help babies breathe (£4k to £20k each), a breast milk pasteurizer (£19k) and devices for treating and monitoring potential brain injury (£20k). There is always an ongoing need for additional and replacement specialist equipment, and also to send staff for specialist training that the NHS cannot provide funding for. 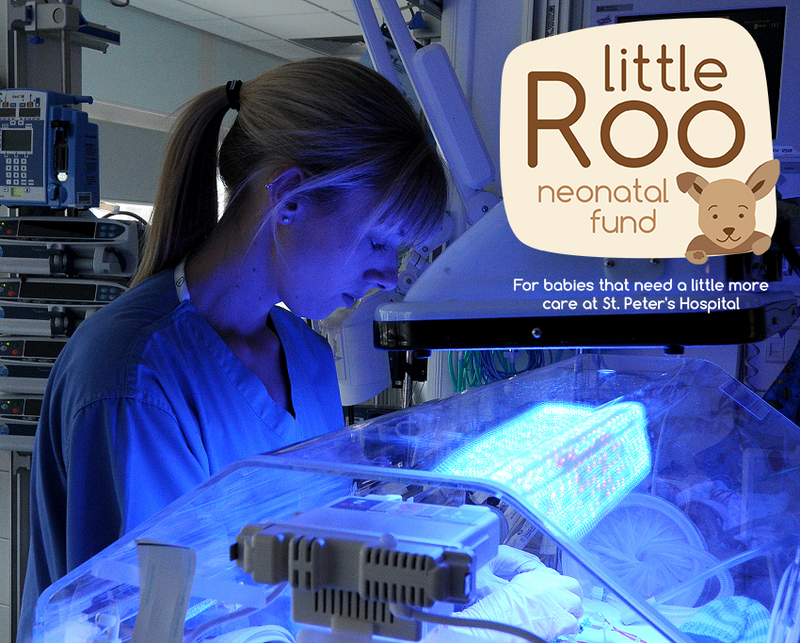 The Little Roo Neonatal Fund therefore raises money to provide the support that the St. Peter’s Neonatal Unit continues to require to offer the highest standards of intensive care for babies born in Surrey and further afield. Please support us and the babies we care for. All donations are invaluable in supporting the work we do. Cheques can be payable to ”ASPH Charitable Fund (NICU)”. We can also be found at www.justgiving.com/LittleRooNeonatalFund which is an easy and secure way of donating by credit or debit card. If you are thinking of organising a fundraising event, or perhaps looking for a charity to support at work or at school, then please speak to a member of staff or call Sid Hurry on 01932 722386. After your fund-raising event has taken place, we like to arrange for you to come to the Neonatal Intensive Care Unit to make a presentation. This gives you the opportunity to meet some of the staff and see the Unit and the sort of equipment that we have been able to buy with donated funds. Our press office would be on hand to take photos, etc and subsequently send an article to the local press for publishing in local papers.